The Moods By Parks range was created to help our customers select the candles, perfume diffusers and other products which directly support the moods, feelings and general atmosphere they wish to promote in their home or any other interior space. Each one offers a handcrafted scent combination that is exclusive to Parks Candles and benefits from our unmatched expertise in formulating high-quality aromatherapy grade scents, as well as our tradition of handcraftsmanship and absolute commitment to purity and quality in everything we produce. Blue chamomile goes by several names, including German Chamomile. It is not, as many think, harvested from blue chamomile flowers. Instead, it comes from the heads and petals of ordinary white chamomile, but is distilled by using traditional steam-based techniques that create azulene, which is in fact blue, by causing a chemical reaction. The resultant oil has an almost inky hue. Blue or German chamomile is considered to be a calming, soothing scent by aromatherapists. Many modern practitioners use this unique, fruity and herbal scent to help people reduce their stress levels and achieve relaxation even when times are difficult for them. 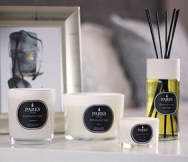 As a part of our Moods By Parks range, the Blue Chamomile Scented Calm Candle is hand poured around a trio of our finest soot free wicks, using our finest 100% pure and natural smoke-free wax. It will burn for some 60 hours of continuous use and hold its delicate, calming fragrance for years between uses, if necessary.